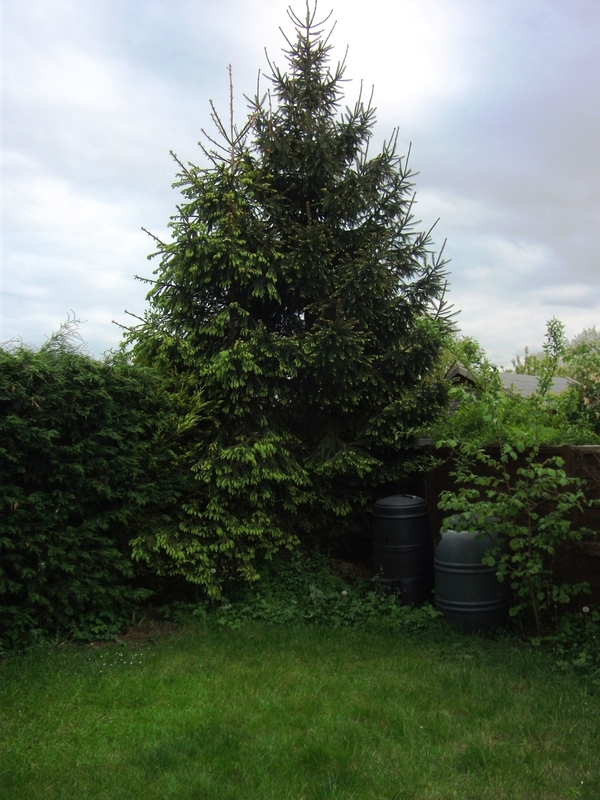 It’s an odd time to be talking about Christmas Trees but at this time of year I look at the postage-stamp sized back garden in the hope that they’ve finally stopped growing … but yet again there are new buds on the ends of all the branches. More than fifteen years ago I moved here just before Christmas and bought a real tree, in a pot, with roots on. The next year I dug it up to use again and was surprised how well-established its roots had become in such a short time. I felt bad about wrenching it out of the ground, especially when it had looked so dead for ages before the first green buds of growth appeared. I promised the tree that if it survived I would never dig it up again. Yes, I know. But it did survive. So naturally the next year I bought a new one … in a pot, with roots on … There was even a third tree that I planted next to these two – so as not to uproot the second tree the next year – but the third one didn’t make it, thank goodness! In more recent years we’ve had a small artificial Christmas Tree but didn’t even bother last Christmas as there was nowhere to put it other than on top of the printer and leaning at a funny angle – but we’d done that the year before and it was just a nuisance, apart from looking ridiculous. I had somehow thought that Christmas trees were a special kind of fir tree that would never grow above ceiling height. I know nothing about gardening and have always lived in houses with established gardens. I never considered that previous residents had chosen and planted the stuff that was there and was amazed when I went round a garden centre with a friend who is a keen gardener and took a look at the price tags. Given the space I could imagine the pleasure of planting something and seeing it grow – especially if it’s fruit or vegetables and I have great respect for trees; it has always upset me to see them cut down.